What are they? Shutters that are hung from the top and guided with an aluminium bottom track. 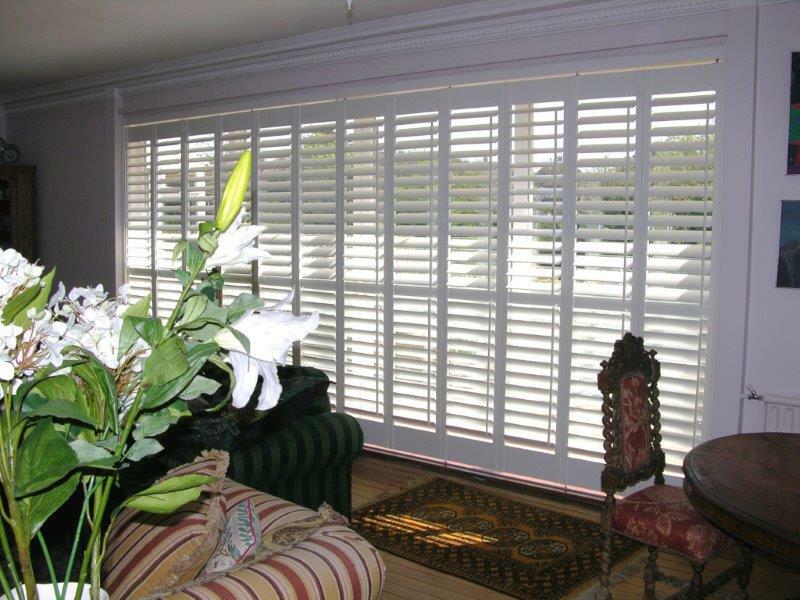 Pros The perfect solution to enable you to have shutters in a larger window or opening. Cons Tracking will increase the cost. Best for Large windows or openings. Shutters are a versatile and stylish window dressing that, although steeped in history, look at home in a new build as much as a Victorian terrace. Whilst shutters are easy to design and install on standard windows, bays and even shaped windows, there are certain openings that require a little thought and alternative options. Span from the mounting hinge is the factor that fills installers with terror and causes designers to alter the options that they offer! Our expert and friendly team are here to help you design the right shutter solution for your French or patio doors, as quickly and efficiently as possible. The rule of thumb is that if your shutters are trying to span a distance greater than they are tall we need to address the mounting options. This is also a factor when discussing Tier on Tier shutters (the stable door style). It is not a concept that is difficult to explain really if you think of it in terms of if you were to hinge your thumb and elbow. You could hang a weight from your thumb (held vertically). If, however, you stretch your arm out and hinge at the elbow, any weight in your hand will cause it to fall. This is the same issue that can occur if you try to hinge a shutter and then hang further panels covering a distance wider than the panel is tall. There are solutions such as sub frames within the main frame using a T post. The down side being the window space will always have some panel coverage. The alternative option is to use a track system where the panels are hung from a rail and slide to clear the window opening whilst all the weight is taken by the track. We can provide tracked shutters in two options of tracking system. Most common is a ‘bi-fold’ system…the alternative option is ‘bi-pass’. Bi-fold shutters have to have an even number of panels going in each direction but hang from a track mounted to the head with a guide track on the floor. All the weight is taken by the wheeled chucks in the track and the panels are then hinged to bi-fold clear of the opening when required. Bi-pass shutters use the same tracks and fixings but slide behind each other to the side to clear the opening. 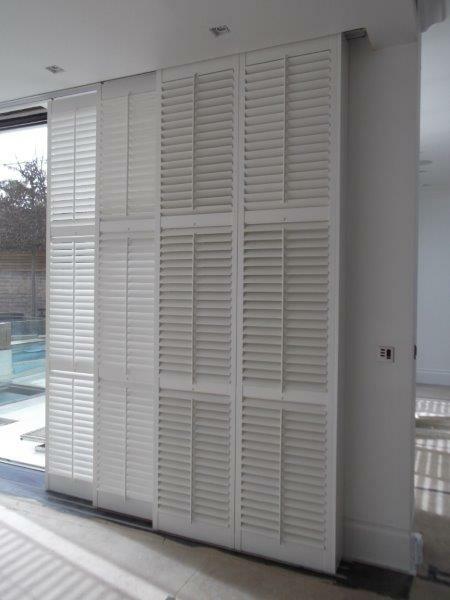 Track shutters are ideal where the opening is very wide or as a room divider. In the past, these systems have been installed without the bottom track but for stability and smooth operation we would recommend, and in some cases insist, on the use of this track. The bi- fold option is most common but does require space as the panels will need to stack back and encroach on the room. 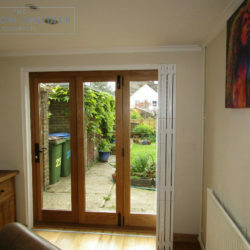 Bi-pass shutters tend to end up covering half the space when opened but do not stick out into the room and, in certain cases, can be slid into a false reveal where possible. A great solution to large areas and stunning alternative to vertical blinds or long curtain runs, this option of mounting shutters can cover any space required and retain the stability required to operate. We will demonstrate and discuss at your design visit and can show the component parts to help you see how this option may work for you. Please take a look at our Checkatrade page for our customer reviews and testimonials.